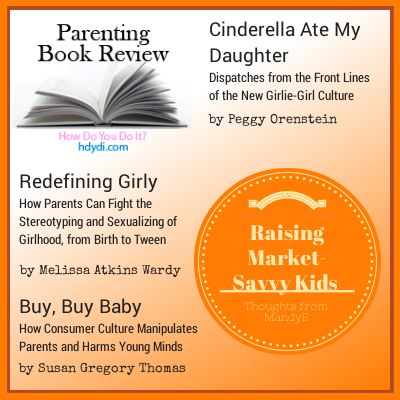 Parenting Books about Raising Market-Savvy Kids | How Do You Do It? I’ve spent my career to date in the field of marketing. While I don’t often think about it in these terms, I’ve devoted my professional self to convincing you how great is the latest THIS, and how much more you need of the super-awesome THAT. Although I know many of the tricks of the marketing trade, I am fascinated to read about the impact of our consumer-driven culture on our kiddos…starting before a baby is even born. 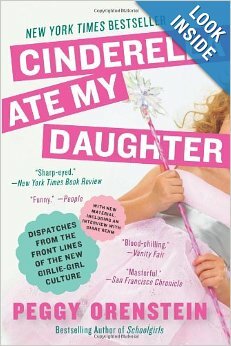 The first book I read on this topic is “Cinderella Ate My Daughter”, by Peggy Orenstein, published in 2011. The book documents the birth of the “princess culture” in the early 2000’s and illustrates the proliferation of all things pink and sparkly. When baby girls come home from the hospital wearing an “I’m the Princess” onesie, suckle a pacifier embellished with a tiara, and wear a tutu before they can walk, our mainstream culture paints a very early, and very narrow, picture of what it means to be a girl. Orenstein follows the princess culture through toddlerhood and preschool, and discusses how it can prime girls for earlier and earlier sexualization. She discusses the dangers of this as relate to the risk for depression and eating disorders, along with numerous other topics in today’s media-saturated world. 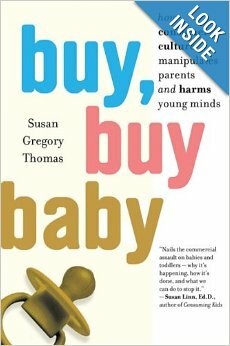 I reviewed this book on my blog a couple of years ago, and a fellow twin mom recommended another book, “buy, buy baby”, by Susan Gregory Thomas. Published in 2007, the book has a broader focus than the “Cinderella” book, but it ultimately centers around the media influence over many parents. Specifically, the book discusses the birth of “educational” videos and toys, and how companies use the insecurities of parents to manipulate buyers. Frighteningly, Thomas points out it is often the video and toy companies who fund research in child development they then use to sell their products. Evidence is presented that some of these “educational” products could actually impair development. 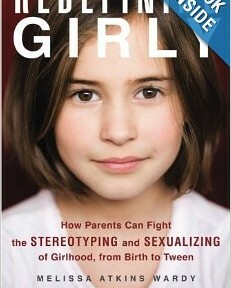 My most recent read is “Redefining Girly”, by Melissa Atkins Wardy. Wardy hits many of the same points as in the “Cinderella” book, but her focus is on both boys and girls. Yes, girls are faced with so much pink and lace and tulle…but boys are faced with equal amounts of rough-and-tough positioned toys. 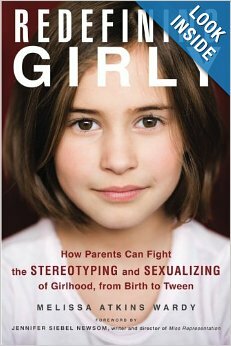 The book opens the reader’s eyes to gender stereotypes on both sides of the aisle. What I love about “Redefining Girly” is that Wardy provides so many wonderful dialogue examples throughout the book. Yes, we know that marketing forces are pervasive in our culture…yes, we recognize that our children often see a narrow definition of what is “acceptable” for a given gender…but…this stuff is EVERYWHERE. 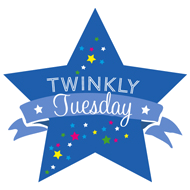 How do we navigate our children through the labyrinth of clothing choices, toy aisles, and birthday party themes? I know there’s nothing wrong with fairy tales or dress-up play, and there are “educational” toys that have a place in many of our playrooms. I love challenging myself to think about the motivations of the companies who sell these products and services to us, though. Our culture is very media-driven, and I believe it’s my job as a parent to make the best choices for my children, and to educate them to begin to make good choices for themselves. This sounds like a good book to go along with my read of “Into the Minds of Babes.” I’ll have to check these out! Thanks! Buy, Buy Baby sounds so similar to Parenting Inc. But I suppose the more books we have out there about this, the more people will get the message. Enjoying princesshood is one thing, I think, but the Disney princessification of everything is another. I see the kids around me no longer content to dress up in their mothers’ clothes. Rather, they now want Disney branded costumes that are exactly like the ones in the cartoons. Even real life princesses like Kate Middleton are a disappointment to these children because they’re not Disney.